Please note these items are special order and is dependant on the suppliers stock levels. Please contact us prior to ordering. The PMC-Eight Electronics are quite unique and special. These electronics are extremely robust. They include a Multi-Processor Micro-controller with 8 CPUs (thus the name) that run independently and are completely deterministic in their behavior. Within this multi-processor system is a 64 Kbyte EEPROM Non-Volatile Memory bank; a Wireless Ethernet 10/100 with full IP function which permits operation from anywhere using a browser, ASCOM, or APP over the web or serial port and Non-Volatile Memory used to store user selected parameters. This system is all controlled from a Windows app for PC, tablet, or phone with a full graphical user interface called ExploreStars - the first application from the OpenGOTO Community. Explore Scientific are currently working with a third party developer that will allow the use of an iPhone or iPad or Apple MAC computer. This will be available shortly after the mount begins shipping." The Losmandy G-11 mount is moved by newly installed high-resolution .09° 400 count stepper motors with a micro stepping controller that makes the motor work at 12,800 steps per revolution with drive rates accurate to a few arc-seconds per day. The Explore Scientific ExploreStars control app, available at the Microsoft App Store: https://www.microsoft.com/en-us/store/apps/explorestars/9nblggh5r3r8, has basic functions found in other GOTO systems, with an important exception, the app and the command language driving the PMC-Eight is open source - meaning anyone can modify the Explore Scientific software or create their own software through their Software Developers Kit (SDK) - and you can download your modified software onto PMC-Eight electronics. Create a Messier challenge. Create a selectable list of objects you want to photograph and program that information into the software. Share it with the community of astronomers that are using this software. Explore Scientific plan to offer a prize with a contest periodically for the best software package written. Classic four-button pattern for guiding, centering, moving and slewing on the touch screen of your tablet or phone. Selectable and User Enterable GoTo, Slewing, Centering and Guiding Rate. The usual standard 1 star, 2 star alignment and 3 star alignment functions are part of the Goto setup. The PMC-Eight also has a 70,000+ object database - but wait until you see the interface - its beauty and the graphics will impress you. Along with Sidereal, King, Lunar, Solar, and user defined tracking rates; Synchronize function; Search function; Coordinate input; Custom mount support using enterable stepper count scaling and Polar Axis Correction (ALIGNMENT PROCESS). For stellar objects, the PMC-Eight uses the Hipparcos/Tycho II database. Where possible, Explore Scientific have cross-referenced the Bayer, Flamstead, SAO, HD/Harvard, DM, BD/CD/CPD, and GSC catalogs. The user can search by any of these designations to find a given star. When the system first starts, it loads the 2,000+ stars of magnitude 5.5 and brighter. The user can load the additional 68,000+ star catalog as needed. For non-stellar objects, we use the RNGC/IC catalog. The system is designed so the user can update the provided catalogs and create your own catalog using tables and scripts in Microsoft Access. Also, each object has a unique ID number, so users can report errors and omissions. Based on the Russell W. Porter Slip-Ring design, this German Equatorial mount is manufactured with all-machined aluminum and stainless steel, and finished in black with a durable hard anodize. Removable stainless steel 1-1/4 inch diameter weight shaft w/safety knob. A 21 lb. counterweight is standard equipment, and optional 7 lb and 11 lb counterweights are available. The G-11 is rated for 100 lbs. total capacity (instruments and counterweights combined). Polar alignment adjustments are precision and smooth. 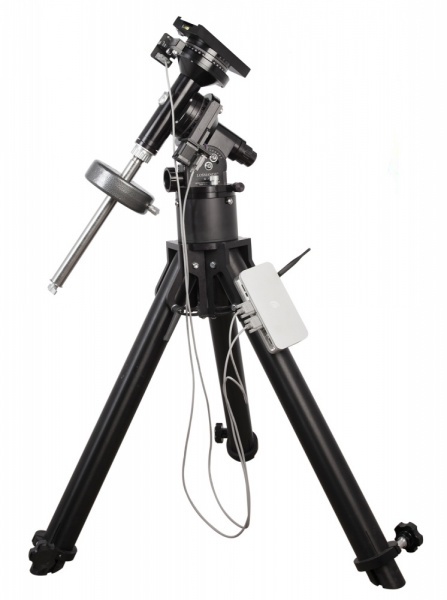 For initial polar alignment setup, the G-11 has two bubble levels and the mount's latitude scale is laser etched in 2 degree increments.The equatorial head is supported by the Losmandy HD Folding Tripod with it's massive 3-inch diameter, continuously adjustable legs for precise leveling. The mount's 1.25-inch stainless steel polar axis is hollowed to allow through the polar axis sighting of the Northern or Southern Celestial pole, and an optional Polar Scope, to help make precision polar alignments quick and easy. The unique fully locking tangent arm design for altitude adjustment for aligning to the celestial pole is from 6-68 degrees latitude, and sports a large easy-to-adjust aluminum knob. The single knob azimuth control is bi-directional with +/- 8.5 degrees adjustment.